Earn $90.00 in Rewards credit (9000 points) What's This? Now 25mm wide, HED's Jet 9 Plus FR Clincher Rear Wheel is updated for even better performance. With and incredible 90mm depth, the Jet 9 provides significant aerodynamic gains over most other wheels on the market, and the use of a carbon fiber shell allows for specific shaping to make the most efficient shape possible. For the best possible performance, HED employs what it calls Stability Control Technology (SCT), which improves handling in crosswinds so this wheel is stable regardless of wind direction. Since it doesn't need to be structural, the carbon can also be made thinner and lighter to shave additional grams off the wheel. The Flame Rouge wheels use HED's exclusive Sonic FR rear hub featuring a full alloy shell. A cap covers an integrated grease port for easy maintenance of the cartridge bearings, while a 15mm oversized axle and extra-wide flange spacing reduces spoke flex and improve overall stiffness. As a final touch, Titanium freehub body hardware shaves a few additional grams. These hubs are laced to the rims using 24 super lightweight Sapim CX-Ray spokes using a two-cross pattern for stiffness and strength. The Jet 9 Plus FR Clincher Rear Wheel is available in Shimano/SRAM 8/9/10/11 and Campagnolo 9/10/11 versions. Claimed weight 1074 grams. Titanium skewer, tubeless rim tape, and valve extender included. Note: This wheel is sold individually. 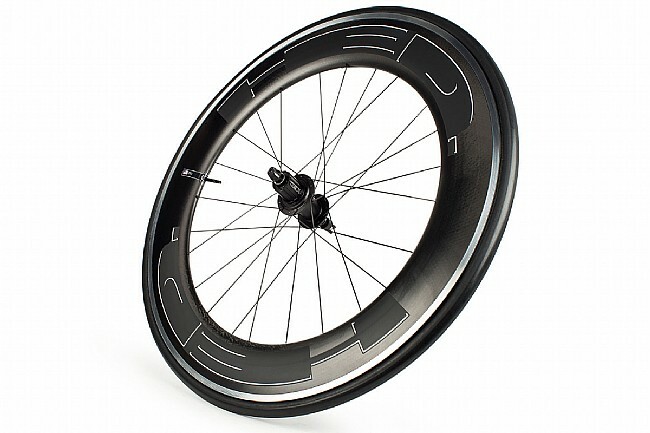 Because many riders prefer wheelsets with non-matching rim depths, a front wheel must be purchased separately. If you would like to pair this wheel with a HED front wheel that is not currently listed online, please contact us for specific availability.